A CHANGE to police procedure has been recommended following the tragic death of a man and his daughter. 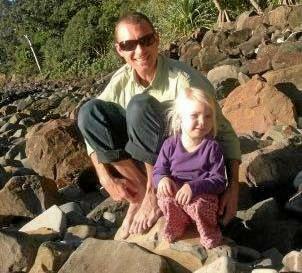 Magistrate Teresa O'Sullivan yesterday handed down her findings from the coronial inquest into the deaths of Gregory Hutchings, 35, and his daughter, Eeva Dorendahl, 4. The pair were reported missing from Pottsville on January 11, 2014, when Mr Hutchings did not return Eeva to the care of her mother, Michelle Dorendahl. Their bodies were found in coastal bushland on January 28. Ms O'Sullivan found Mr Hutchings ended Eeva's life before taking his own. She recommended NSW Police amend standard operating procedures and the police handbook so that a child who is not returned by a parent accordance with a parenting plan or court order is treated as a missing person. Michelle Dorendahl's first report to police on the afternoon of their disappearance was recorded as a "custody issue", but this was later upgraded and police issued an alert citing "serious concerns" for their welfare the following day as search efforts ramped up. Ms O'Sullivan said it was "not possible" to know the "exact medical cause of death" for either of them, but she relied on a "significant amount of circumstantial evidence" in that finding. She said both Eeva and her father were "much loved by their family members and continue to be missed" and extended her "deepest sympathies" to both families. The inquest heard Mr Hutchings had been seeing a GP and psychologist and had experienced worsening mental health when Eeva and her mother travelled overseas, including in December, 2013 but neither practitioner believed their patient was "an acute risk to himself or others". "There is sufficient evidence that Greg Hutchings had declining mental health at the time he was responsible for the death of Eeva and himself," Ms O'Sullivan said. "That does not excuse the actions he took which led to Eeva's death, but it does help to understand why a father who loved his daughter and loved his own mother and extended family, would commit such an act, that is anathema to the role of a parent to protect their child." Ms O'Sullivan was "not critical" of the time it took emergency services to locate the pair as they "did commit significant resources and effort to finding Greg and Eeva". But she said there was "room for improvement" with the use of existing procedures, including a checklist process that was not followed. "There is no doubt that the gravity of the circumstances were not entirely obvious early in the incident, since Greg had failed to return Eeva previously, had been polite to Michelle Dorendahl in recent texts and emails," she said. "A focused checklist and risk assessment may have highlighted the significance of Greg's deteriorating mental health from an early stage."